It is often said in jest that if you don’t like the Icelandic weather, just wait five minutes. This was my first experience of this stunning country and the weather lived up to its reputation with storms one minute and bright sunshine the next. I was in Iceland’s capital Reykjavik to attend the Tile Awards 2017 workshop joining a diverse group of other competition winners as we explored the country’s architecture and gathered together to work on and showcase our winning entries. 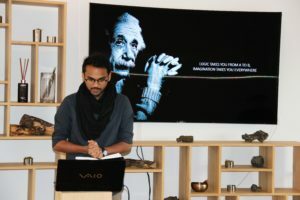 The workshop took place in a converted warehouse setting the scene for a highly interactive and informative few days under the guidance of organisers AGROB BUCHTAL and ATI-Dialogue. We began with the individual presentations for our concept submission. 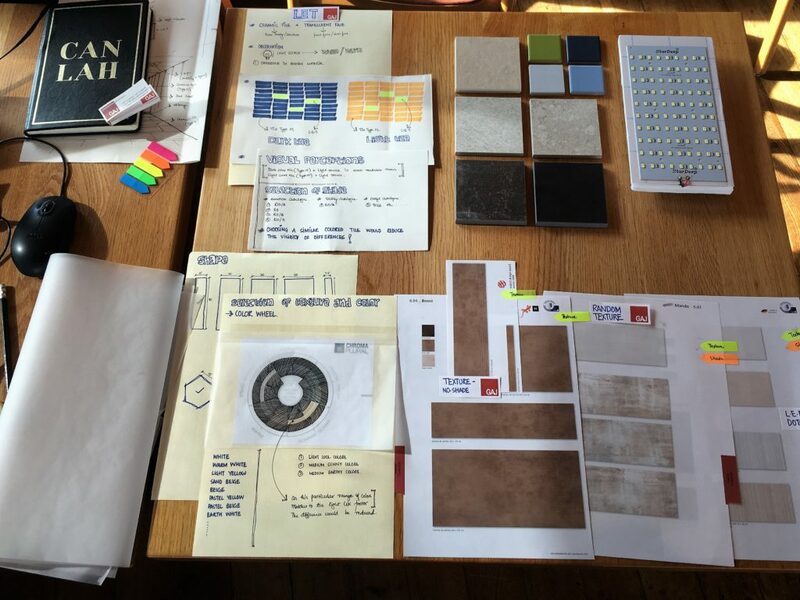 The main objective of the workshop was to transform our submissions from concept design to reality which, for my submission, involved a considerable amount of time spent experimenting with LED lights and tiles attempting to recreate this into a 30 square metre space. I started by looking into the practical solution of fusing the LED Lights to the ceramic tiles preparing manufacturing layouts, dummy models to test the workability and application of the design. During the course of the day we discovered that a leading magazine was scheduled to come and photograph our designs, one of which would grace the cover of the January issue. 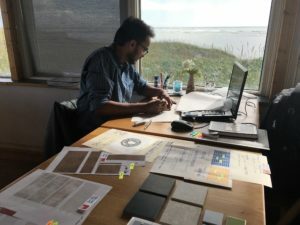 On the second day of the workshop we took an enlightening tour of Iceland to see the country’s unique approach to architecture. Due to its volcanic origin, the island neither provides sustainable clay for bricks nor easily processed stone so are reliant on alternative methods of construction. Modern Icelander’s use corrugated sheet metal from England as external cladding and everything is designed to reflect the character of the inhabitants and their individuality. One of the most common settlements, many years ago, is the turf house. These turf houses, which blend seamlessly with their surroundings, were created as a result of the cold weather and the natural materials available for construction at that time. They are very eco-friendly. Another is the Nordic House designed by acclaimed Finnish modernist architect Alvar Aalto. It is said that the Aalto Bistro has all the elements of design that Alvar Aalto used during his prodigious career. And it was here where we had our second workshop which required us to team up with our fellow participants to further develop our designs. On the last day we headed out to the beach and surrounding countryside to a picturesque turf house surrounded by black sand for our final workshop. The plan for the day was to prepare the templates and detailed drawings for the space that we wanted to conceptualise for the magazine cover. This involved bringing the ambience to life though the material shape and the finer details to produce, what turned out to be, some extraordinarily space designs. Gullfoss is a waterfall located in the Canyon of Olfusa River in southwest Iceland. Hafnarhus art museum. Part of the trio of buildings that make up Iceland’s largest art museum, featuring pop art by Erró. The Nordic House was designed by the Finnish modernist architect Alvar Aalto.